Plant type: An indoor/outdoor flowering plant, native to Tropical South and Central America. Light: Low to medium light, but prefer bright filtered light. Protect from direct sun that can burn their foliage. Moisture: Regular watering and moderately. Let media’s surface to approach dryness between waterings. Soil: Well-drained loam-based medium, preferably an equal mix of garden soil, peat and sand. Keep soil moist at all times so that plant will not wilt, but not overly wet that can cause leaves to wilt too. Propagation: By dividing the plants into smaller clumps and replanting the divisions, checking that each division has roots. Plant them in a well-drained potting mix at the same level as they were originally, and water lightly until the roots are established. 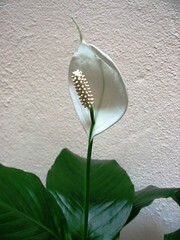 Features: Spathiphyllum spp. is an evergreen clump-growing herbaceous perennial. 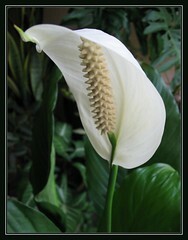 There are about 36 species in the genus Spathiphyllum and varying by leaf size and color, height (ranging from 1-5ft. 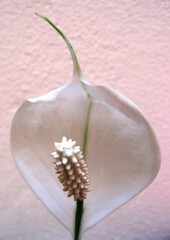 ), color of spathes, and blooming intensity or frequency. Generally, it has glossy, dark green, lanceolate leaves that are thin and deeply veined. Basal leaves on long petioles arising from the underground rhizomes give the plant a bushy appearance. Periodically, this evergreen aroid will produce a number of showy white flowers on tall and erect flower stalks, rising above its attractive foliage. It consists of small flowers on a white or off-white spadix that is surrounded by a single white or greenish, flattish or concave spathe (bract), resembling the hood of a cobra. The long-lasting flowers start out whitish and slowly turn greenish as it ages. Usage: Peace Lilies are popularly grown indoors as potted houseplants or in green houses for their attractive foliage as well as their snowy white flowers. Also, Spathiphyllum is widely used for interior decoration or interior plantscaping due to its exceptional acclimation to low light conditions and air purifying properties, removing toxins from surrounding atmosphere. Excellent too for mass planting outdoors in garden beds or borders, as well as in containers for decks and porches. Care: Keep plant healthy by showering its leaves every now and then or wipe them with a sponge to remove dust and dirt. 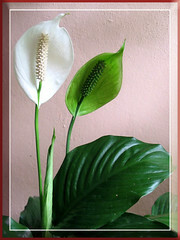 Peace Lily can attract mites, scales and mealy bugs so cleaning will help keep these pests away. Cut away spent inflorescence together with the flower stalk and remove yellow and dried leaves. Ensure that it is properly watered, receiving enough light and warmth, maintain high humidity, plus monthly light-fertilizing with a balanced fertilizer. Avoid cold drafts that may damage the plant. Repotting should be done every third year in the spring when it is overly pot bound, or coincide with propagation by dividing the clumps and replanting in new soil. To induce flowering, locate plants in low light environment. Be aware that Spathiphyllum leaves are known to be poisonous, and causes severe pain in the mouth if large quantities are eaten. This species is a small, compact plant with a height of 12-15 inches and as wide, with pure white 3-inch flowers that consist of a lovely concave spathe and spadix. A vigorous grower with lustrous dark green leaves that are slender and lanceolate. We’re so thrilled and overjoyed! These plants have been in the same pot for 3 years and finally decided to reward us with a lovely surprise! :) Never before have they burst with more than two blooms at any one time and here there are eight beauties altogether! Wow! And amidst them, a very unique bloom with two spathe and a stunted spadix which sprouted from the base of the larger spathe and growing towards the tiny spathe. Can you spot it? Marveling at their beauty and form led me pondering! It’s as if they’re waving their peace flags and beckoning us mankind to strive to live in peace and harmony! Imitate us…imitate us!…see… full blooms, buds and ‘unique bloom’ (representing the developed, developing and under-developed countries respectively) growing together as one? 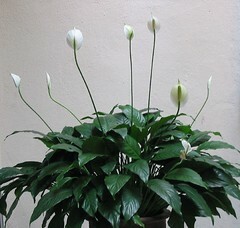 This is another species of Peace Lily added to our foliage collection, given by a close friend. 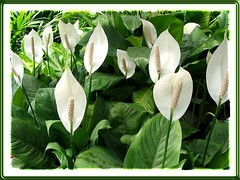 It is of the medium large-sized Peace Lilies, maturing to a height of about 3-4 feet. Its glossy and dark green, lance-shaped leaves are large and broad (10-12 ins. long and 6-7 ins. wide) on 10-15-inch stalks. Leaves have ribbed-texture and a slight wavy margin. Its pure white and long-lasting oval blooms are large too (3-4 by 6-7 ins. ), displayed on long flower stalks (15-20 ins.) and held elegantly above its beautiful foliage. Both spathe and spadix will gradually turn greenish as it ages. I’m wondering whether the Spathiphyllum species in the right image is that of ‘Lynise’? The green leaves of ‘Lynise’ are broadly lanceolate to elliptic and have a matte finish look. This variety produces large quantities of flowers with narrow spathes naturally and is a fairly vigorous grower.